"This territory was settled in the 3rd century before Christ and there were old settlements in this area. The first written record of the town was in 1260. It belonged to the Galician Volyhnian Kingdom until the middle of the 14th century. Danielo Halisky became Duke and then King of that Kingdom. At the end of the 14th century Buchach was invaded by Polish landlords. In 1515 the city received self-government. Since 1558 there were big markets twice a year and every week on Thursday there were also small markets. In 1672 the town was occupied by the Turkish army and on October 18 a peace agreement was signed with Turkey according to which all Podolia has become part of the Turkish state. The border was along the Strypa River and divided the town into two parts --- the eastern Turkish and the western Polish parts. In November 1673, the peace treaty broke down and Buchach became Polish again. In 1772, after the first partition of Poland, Buchach became part of the Austro-Hungarian Empire. In the 17th century, the Basilian Monastery was founded. In 1754 ageneral latin school was established. In 1784 a 3-grade public school was established which was reorganized into a 5-grade school in 1804. Since 1820 it has become a 6-grade gymnasium. 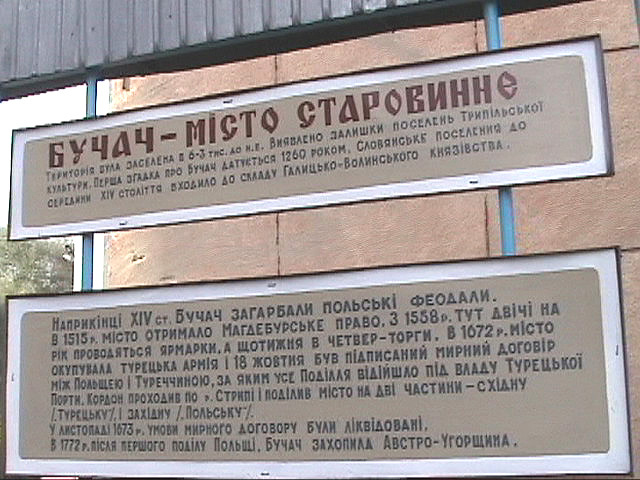 Famous Ukrainian politicians, writers, poets, artists, and others studied at this school. According to the Schonbrun peace agreement, from 1809 to 1815 the town belonged to Russia. The first railroad went through the town in 1884. In November of 1918, after the Austro-Hungarian Empire collapsed, Buchach became part of the Western Ukrainian People's Republic which existed for only a short time. In July 1919 the city was occupied by Polish troops. A year later on August 10, 1920 the Red Army took the town. On September 15,1920 Polish troops again took Buchach. On September 18, 1939 the Red Army occupied the city and Buchach became part of the Ukrainian Soviet Republic which existed until August 24, 1991. On July 7, 1941 Buchach was occupied by Nazi troops and was liberated on July 21, 1944."